Mukesh Ambani: He opened a can of worms with his candid admission in a TV interview on the famous 'ownership' tussle. The 48-year-old chemical engineer studied business at California's Stanford University and joined RIL in 1981. He is known as the boardroom boy, drawing strategies and business expansion plans of the Reliance group. Reliance Infocomm is his brainchild, though it has now been handed over to his younger sibling Anil. Mukesh gets the group flagship Reliance Industries Ltd and IPCL. 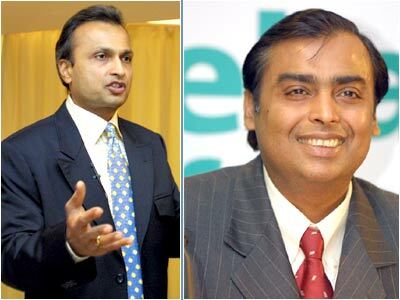 Anil Ambani: The 46-year-old younger brother was always the public face of Reliance. A science graduate and an MBA from the Wharton School, University of Pennsylvania, he is credited with having pioneered the company's forays into the overseas capital markets. Anil Ambani (left) and Mukesh Ambani. rediff.com file photogarphs.